Coming off a solid junior season that saw him take home All-ACC Third Team honors, North Carolina's Brice Johnson emerged in a huge way as one of the most productive big men in the country as a senior. Taking a significant step forward in his development averaging 17 points and 10.5 rebounds per game while helping guide the Tar Heels to a National Championship appearance, Johnson solidified his standing as one of the top NBA prospects in the senior class and a potential first round pick. Johnson's NBA potential, as it has throughout his entire career, starts with his sensational athleticism, even if he's a bit of a mixed bag from a physical standpoint. At 6'9 with a 6'11 wingspan Johnson lacks great length for his height, and even though he's added some 40 pounds to his frame since his high school days, remains fairly skinny. The South Carolina native does not have outstanding size, but he is, without question, an outstanding athlete. A bouncy interior player with good speed, impressive fluidity, and the type of elite leaping ability that allows him to play above the rim with absolute ease, Johnson's explosiveness is his clear calling card as a prospect. Putting his athletic merits to good use on the offensive end, Johnson did most of his damage this season as a finisher, primarily off of cuts, put backs, and fast breaks as his effort, instincts, and explosiveness frequently paid off inside. He also saw touches consistently one-on-one in the post as he created some 30% of his offense himself operating on the block according to Synergy Sports Technology. He ended the season ranked eighth in the country in points per possession among the 267 Division I players who used over 500 total possessions. Upping his scoring rate from 19.7 points per 40-minutes pace adjusted as a junior to 25 as a senior, Johnson took on and excelled in a bigger role emerging as the first option on a balanced Tar Heel squad that looked far better on offense some nights than others. When the Tar Heel offense was rolling, Johnson was one of the primary beneficiaries, as he was one of the most efficiency scorers in the country converting shots created for him. Finishing at an outrageous 83% clip in transition and a markedly improved 69% in the half court, up from 64% a year ago, Johnson's ability to convert lobs, dump-off passes, and create easy shots for himself on the glass stood out at times. A highlight waiting to happen, Johnson seems like the type of athletic big man who could contribute at the next level with his hustle on the glass and athleticism off the ball, especially if he's paired with a dynamic, shot creating guard. On top of his ability to finish, Johnson's athleticism also translates fairly well to the post. Lacking great bulk, he isn't adept at establishing deep position inside, but he has solid footwork and though his repertoire is a bit predictable, his ability to elevate often allows him to get his shot off when well defended. Making quick, decisive moves on the block, Johnson makes hook shots at the nice rate over his left shoulder and has fairly solid touch on his turnaround jump shot over his right, but will also use aggressive drop steps to get to the baseline where he tries, and sometimes succeeds to score from difficult angles jumping from behind the rim. Johnson doesn't tend to use many counter-moves, leading to some tough shots when the defense anticipates his first move correctly, but the senior shot a very respectable 48% operating one-on-one on the block nonetheless, thanks to his ability to use his athleticism to shed his defender or rise up and score over him at the college level. Doing the vast majority of his scoring inside, it will be interesting to see how Johnson's offensive game develops in the coming years. His lack of strength may prove more problematic at the NBA level than it did in the college game, and though he only made 36% of the 44 shots he took outside of 12 feet last season, he seems to have some potential as a mid-range weapon. Shooting 78% at the line and making spinning jump shots out of the post at a nice rate, Johnson's form is a bit rigid at times, but his mechanics are fairly consistent and he looked comfortable from the midrange at times when spotting up, leaving some room for optimism that he may become a threat to space the floor a bit and do some damage away from the rim. Johnson was a very effective scorer and offensive rebounder this season, but the rest of his skill set, like his jump shot, appeared to be a work in progress, as he lacks a degree of versatility. He is a decent interior passer but isn't going to provide much value as a playmaker, and though he can attack slower big men off the bounce, he often plays too quick for his own good when looking to slash the rim. He does a nice job on the offensive boards and rebounding the ball in general, but hasn't been overwhelmingly productive in that regard. Nonetheless, the soon to be 22-year old power forward has a number of tools that could help him find a niche offensively on the right team in his career. Defensively, Johnson averaged a fairly impressive 2.1 blocks and 1.5 steals per-40 minutes pace adjusted, but digging deeper, has a lot of room to grow on this end. He struggled with foul trouble on a number of notable occasions, still lacking a degree of discipline, awareness and feel inside. More than athletic enough to hold his own defensively at the college level, Johnson had some nice moments using his leaping ability rotating over to the weak side to protect the rim, but also struggled at times, notably with lapses biting on fakes on the perimeter or getting out of position in the pick and roll. Johnson doesn't always make the most of his quickness pressuring the ball away from the basket and his lack of lower body strength limited him in the post against some players as well. Looking lost, unfocused or disinterested some possessions, Johnson has to tools to be more of a consistent presence on this end, and it will be interesting to see how he progresses as a defensive player at the pro level. An emotional player who absolutely came into his own as a senior, there's a lot to like about Johnson as a prospect. Despite his experience, he still has some things to iron out and has some upside, which is saying something given that he was one of the most impactful players in all of college basketball some nights last season. Johnson figures to be in a mix to hear his name called in the first round come draft day, and is a name to keep an eye on throughout the coming months as he sits right in the middle of what has become a very intriguing power forward class. 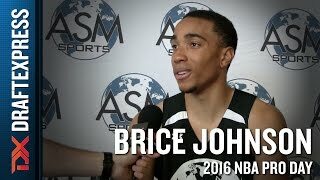 Before Brice Johnson came to North Carolina as a top-50 prospect in the class of 2012, he was a track and field star at his South Carolina high school. Johnson specialized in jumping, winning two state championships in the high jump and competing in events for the long jump and triple jump. Naturally, Johnson translated those leaping abilities to the basketball court  where he also excelled. Johnson arrived at North Carolina as a lanky 6'9, 187-pound work-in-progress. Since then, he's built onto his frame significantly, maxing out at 232 pounds last season before slimming back to 225 this summer in an effort to regain some speed and agility. The added bulk seems to have affected his explosiveness to an extenthe's no longer quite as fast twitch as he was as a freshman, and struggled to maintain the same terrific per-minute offensive rebounding, block and steal rates he produced as a sophomore, seeing substantial drops in each category. Now entering his senior season on Tobacco Road, Johnson is going into an extremely important year. The Tar Heels are considered potential Final Four candidates, and Johnson has one last opportunity to impress scouts and show he is worthy of a NBA roster spot. Johnson possesses a coveted blend of mobility, size, and scoring instincts that simply aren't common in the college game. After he earned the starting forward job at UNC as a junior, and saw his minutes jump from 19 to 24 per game, he quickly became one of the team's most reliable players, maintaining a high efficiency (59% True Shooting Percentage) in spite of the fact that his usage remained the same. Johnson averaged 19.7 points and 11.8 rebounds per-40 minutes pace adjusted last season, both of which ranked in the top 10 of our database's top 100 prospects. He's a skilled finisher with an impressive knack for being in the right place at the right time. His soft touch can be surprising at times considering he often looks off-balance on his attempts, but he's remained consistently efficient in his college career and clearly has excellent scoring instincts. Last season, Johnson converted on an excellent 103-of-160 (64.4%) on non-post up attempts around the basket in the half court. He also consistently rebounds his own misses thanks to his ability to leap twice before opponents finish leaping once. Johnson's explosiveness is also advantageous in transition, where he's extremely mobile and coordinated for a big man. Johnson regularly outran his defenders on the break, resulting in an astoundingly efficient 36-for-39 on field goal attempts (92.3%) in transition last season, per Synergy Sports Technology. Almost all of Johnson's offense comes inside the paint, as he attempted just a handful of jump shots last season and hasn't shown much potential as a floor spacer, which is fairly common among UNC power forwards. At 6'9, without a great frame, he's undersized on the interior, so it's difficult to see him continuing to see as many touches with his back to the basket as he does for UNC. Johnson's free throw percentage has improved from 57% as a freshman, to 62% as a sophomore to 68% as a junior, which is a promising sign. Though he shows an adequate form and a high release point on his shots from midrange, he's a reluctant shooter outside of the paint. What makes this reluctance surprising, though, is that he shows fairly nice touch in the handful of jumpers he did attempt, even using the glass nicely at times. It will be interesting to see whether Johnson gets a little bit of a longer leash as a senior, as Carolina possessed little in the way out of outside shooting last year and really struggled with floor-spacing at times. Part of UNC's reluctance to allow Johnson to operate on the perimeter may stem from what appears to be a fairly average feel for the game. If Johnson wasn't so efficient, he would surely find criticism for being a black hole. He averaged just 1.4 assists per-40 last year, dishing out an assist on just 7.5% of his possessions, one of the lower rates among Top-100 prospects. With the amount of offense that runs through the power forward position at the NBA-level these days, scouts would probably like to see Johnson demonstrate better court vision and passing ability than he's shown up until now, although to his credit, he is far from turnover prone (career 11.5% turnover%). Johnson was one of the better rebounders in the ACC last season, grabbing 11.8 per-40, one of the better rates among power forwards in our Top-100 rankings. Though he puts up strong numbers on the boards, Johnson actually has significant room to improve as a rebounder. He still shies away from body contact with opponents  largely due to his wiry frame  and doesn't work particularly hard with box-outs. Johnson is able to use his quickness, length and instincts to pursue loose balls impressive at the college level, but in the NBA he may not be able to solely rely on these terrific tools to make him a plus rebounder. Defensively, Johnson has something to prove to NBA scouts still as well. He does not possess great instincts here, often biting on pump-fakes and looking a step slow to react to what's happening on the floor, particularly in terms of closing out on the perimeter. His ability to get in a low stance and stay in front of quicker opponents who draw him outside of the paint needs to improve as well, and he has somewhat of a laid back attitude on this end of the floor, not always playing with the highest intensity level. Johnson's lack of strength is an issue here as well, as it's not rare to see stronger opponents have their way with him due to his very skinny frame, which causes him to get in foul trouble easily. His length, quickness and explosiveness gives him some potential here, though, and he moves extremely well for a player his size, and will have some very impressive possessions at times when he's fully dialed and operating at full intensity. All in all, Johnson's combination of athleticism and scoring instincts will certainly catch some NBA teams' radars. His skillset is fairly confined, but he manages to stay productive nonetheless. Not many big men move or finish as well as him, and if he can continue to expand his shooting range and show he can hold his own defensively, he could easily convince a team to invest a few years in him to see how much further his frame, feel and skill-level can continue to evolve. Still, with this being his senior season, he will need to show improvement if he wants to advance his chances. A top-50 high school recruit from South Carolina, Brice Johnson came into college weighing just 187 pounds, despite standing 6-9. He started the season off extremely well but cooled somewhat as the year moved on, seeing fewer minutes down the stretch due to Roy Williams' decision to play smaller lineups with James McAdoo at center and P.J. Hairston at power forward. Up to 205 pounds now reportedly after a full offseason working in North Carolina's renowned strength and conditioning, Johnson will be looking to build off a promising freshman campaign and establish himself as a legitimate NBA prospect. Johnson did not play major minutes as a freshman, but nevertheless was able to drop some impressive glimpses of potential, on the offensive end in particular. His per-minute numbers were very strong, even when adjusting for UNC's torrid pace, at 18.2 points, 11.3 rebounds and 1.7 blocks per-40 pace adjusted. The main intrigue surrounding Johnson as a long-term prospect revolves around his excellent combination of size, mobility and scoring instincts, as well as the fact that he did not turn 19 until this past summer, making him one of the youngest players in college basketball last season. Johnson is a very good athlete, running the floor well and being an extremely quick leaper. That makes sense considering he was a gifted track and field star in high school, winning consecutive South Carolina state championships in the high jump, as well as competing in the long jump and triple jump. Johnson's athletic prowess translates well to the basketball court, where he is an excellent finisher around the basket thanks to his mobility and terrific touch, being a regular recipient of lobs from UNC's guards because of how reliable he is around the rim. Highly aggressive calling for the ball and looking to establish position inside, Johnson saw a fair amount of touches in the post last season, even if he struggled at times to convert his looks due to his lack of bulk. Still, he shows good potential as a back to the basket scorer, being very assertive trying to post up opposing big men, displaying nice footwork and feathery touch on his hook shots and turnaround jumpers, and sometimes finishing in impressive fashion off the glass. It will likely take a number of years for Johnson's body to catch up to his skill-level inside the post, but the fact that he shows the willingness and ability to throw the ball in the basket so easily, despite how frail his frame is currently, has to be considered a good sign for the future. Where Johnson can already be effective is playing off the ball, be it off cuts, as a pick and roll finisher, crashing the offensive glass, and running the floor in transition. He made an impressive 71% of his non post-up attempts around the rim in the half-court as a freshman, again showing good mobility, reliable hands, and the ability to finish strong from a stand-still off two feet with relative ease. Johnson should be able to extend his range comfortably outside the paint, as he shows good shooting mechanics and the ability to knock down jumpers out to about 18 feet, particularly from the baseline. His shot-selection leaves something to be desired, though, as he tends to shoot the ball any time he touches it with even a hint of daylight, which may not have always endeared him to his teammates and coaching staff. Gaining a better understanding of what his limitations are will be important as he matures and receives more playing time. Where Johnson will likely have to improve the most in order to earn minutes and establish himself as a legit prospect is on the defensive end. He struggles badly here at times due to his frail frame and average toughness, getting pushed around mercilessly by stronger opponents. He also doesn't seem to have the best fundamentals here either, biting on pump fakes and regularly falling asleep and giving up deep position before his man even catches the ball. On the perimeter, Johnson shows good mobility with his ability to cover ground quickly and hedge the pick and roll, but gets beaten off the dribble too easily by more skilled power forwards. He shows good timing as a shot-blocker and rebounder to go along with his strong athleticism, though, so it's possible that with added strength, experience and coaching he could make some serious strides as time moves on. All in all, Johnson is a very raw prospect who is still far from garnering legit consideration as a NBA draft prospect at this point in time, even if it's difficult not to be impressed by his physical tools and natural knack for scoring which simply cannot be taught. It will be interesting to see how much additional playing time he will be able to garner in the incredibly crowded frontcourt that Roy Williams has assembled this season, as he'll be competing with no fewer than six other big men in James McAdoo, Joel James, Desmond Hubert, Jackson Simmons, Kennedy Meeks and Isaiah Hicks for minutes. Considering that UNC played some of their best basketball with four guards on the floor last season, there might not be all that much playing time to go around, which could lead to some disappointment. Nevertheless, Johnson is a prospect that scouts will continue to track the next few seasons to see how his body develops and skill-level evolves over time.